The Wise Woman Tradition is the oldest tradition of healing known on our planet, yet one that is rarely identified, rarely written or talked about. A woman centered tradition of self-love, respectful of the earth and all her creatures, the Wise Woman Tradition tells us that compassion, simple ritual and common herbs and remedies heal the whole person and maintain health, wholeness and holiness. In the Wise Woman Tradition good health is flexibility, openness to change, availability to transformation, and groundedness. In this tradition we nourish health, wholeness and holiness in each individual, ever aware of each individual as holographically related to family, community and the universe in spiralling, ever changing completeness. Problems become doorways of transformation. 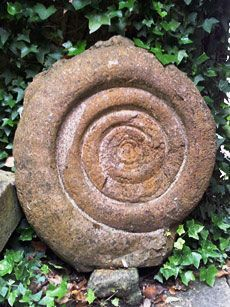 The symbol of the Wise Woman Tradition is the spiral. A spiral is a cycle as it moves through time. A spiral is movement around and beyond a circle, always returning to itself, but never exactly at the same place. Spirals never repeat themselves and remind us that life is movement, that each moment is unique, and that form is the essence of transformation. The spiral is the bubbling cauldron, the curl of the wave, the lift of the wind, the whirlpool of water, the umbilical cord, the great serpent, the path of our earth, the twist of the helix, the spin of our galaxy. The spiral is a labyrinth, it is the womb-moon-tide mobius pull. 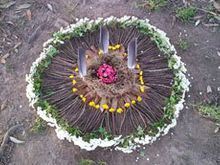 The spiral is your individual life, it is the passage between worlds; birth passing into death, death passing into birth. The path to enlightenment is the spiral dance of bliss. In the Wise Woman Tradition, all health, all coming into wholeness begins with a return to the void. To heal, to become whole, we turn again around the spiral of our life. We turn again around the spiral and enter the void, the great unknown, knowing only that our form is reformed, that our form is transformed, that rebirth inevitably follows death. When we resist death of a situation or project, or stage of life, our return to the void, we call it "our problem." The problem is I'm in pain. The problem is I am out of control. The problem is I am falling, without chance of stopping, falling into the void of beginnings, into the void of all ends. The Wise Woman Tradition asks us to let go and fall. Fall into the void. Fall into the open arms of the Mother. Add on to yourself by letting go of everything. Become whole and healthy by turning on the spiral, by returning to the void. Problems, pains, diseases and illnesses are not seen as such. In the Wise Woman Tradition they are honoured, supported, respected for their truth, nourished and added on to the truth of the whole being. Each problem is acknowledged as a step to transformation and growth. Nourishment encourages expansion and growth. Nourishment includes and supports each being as unique, holy, individual. Nourishing our problems encourages love for all parts of ourselves, we become whole, and genuinely who we are, we stand in our authenticity of our story. Disease and illness are recognised and diagnostic skills are honoured within the Wise Woman spiralling way, but the focus is on the person as an individual, not as the disease as an entity. The dis-ease is seen as an ally to wholeness through a journey of transformation and personal discovery.